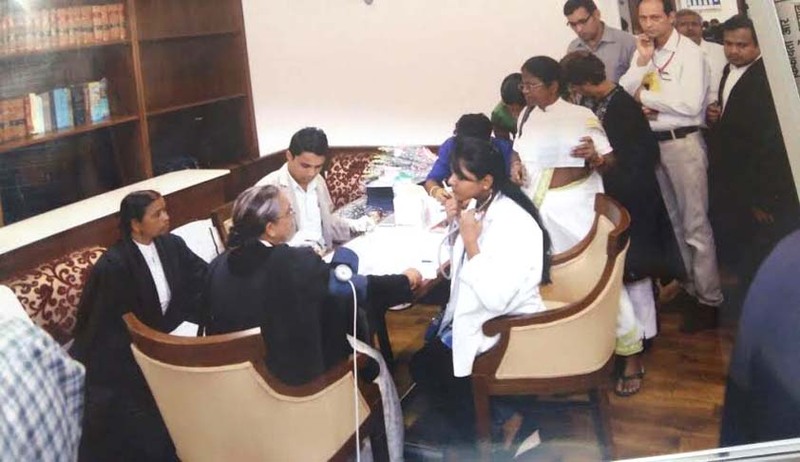 The New Bar Room opposite the Advocate On Record Association office in the Supreme Court recently resembled a buzy hospital as it was host to a first of its kind medical camp within the apex court premises. Though such camps have been held earlier too, Electrocardiogram (ECG) and Bone Mineral Density machines were rolled in for the first time in the free camp conducted by the Supreme Court Woman Lawyers Association. It was hosted in association with Max Hospital, Shalimarbagh and Dr. Urvashi Chandra, Skin Specialist. Approximately 700 members of the Bar made use of the six hour long camp. Members between the age of 25 to 89 were seen taking keen interest in acquiring healthy skin and hair related information. Dr. Chandra is a Skin & Hair specialist with an experience of many years and celebrity clients like Virendra Sehwag. The team from Max Hospital included Cardiologist, Orthopaedic and Medicine. About 250 members got their ECG done consulted the Cardiologist while 400 members got their Bone Mineral Density test done and consulted the Orthopaedic. The registration began at 10 in the morning with relatively lighter footfalls. The registration was followed by blood sugar test and blood pressure status however, by 3pm the registration counter was flooded with members of the Bar who were then informed that the registration was closed due to paucity of time. The Camp was concluded after the last ECG was conducted at about 4pm. The Office Bearers of the SCWLA worked together and were seen assisting the members of the Bar. Senior member of the Bar appreciated the SCWLA's initiative and congratulated the General Secretary of SCWLA - Ms. Prerna Kumari, for organising such a medical camp for the first time in the Supreme Court Premises and conveyed their best wishes and blessings for many more such camps. The Doctors and their team were felicitated by Ms. Mahalaxmi Pavani - President, Ms. Bhakti Pasrija - Vice President, Ms. Prerna kumari, Ms. Mansa Singh - Asst. Secretary, Ms. Sudha Pal - Treasurer, Ms. Subhra Saha - Asst. Treasurer, Ms. Maheravish Rein & Ms. Mamta Rani - Member Executive.